Brought to you by Heineken. When it comes to breakfast food, we’re with Ron Swanson: it’s the best damn thing going. But when it comes to dragging our butts out of bed, we’re with Andy Dwyer: later is better. Fortunately, a compromise exists in the form of brunch, and Montreal is replete with awesome brunch spots. Some people settle for brunch only on Sunday. Those poor souls have never been to Café Régine. Not only can you eat the most delicious meal invented every single day of the week, you don’t even have to settle on one thing. Order un peu de tout (that’s a bit of everything), and you’ll get a little tower of crumpets, fruit, spreads, and more. What makes a Montrealer wait in line for forty-five minutes? For mere brunch? Well, it may be house-cured gravlax. Or the Bulgarian benedict, featuring poached eggs, feta, garlic yoghurt, and paprika oil. Or the tongue-melting maple fried challah bread French toast. Trust us, you want the French toast. No matter what you order, or what your dinning companions order, get some French toast and split it. Perogies? For breakfast? Well, no. Stash doesn’t even open until 11:30, but some of us need a brunch spot that caters to people with hangovers, and Stash’s veal scallops come with eggs sunny side up. Or you can try some potato pancakes. Either way, it’s brunch for people who don’t line up at ten in the morning. 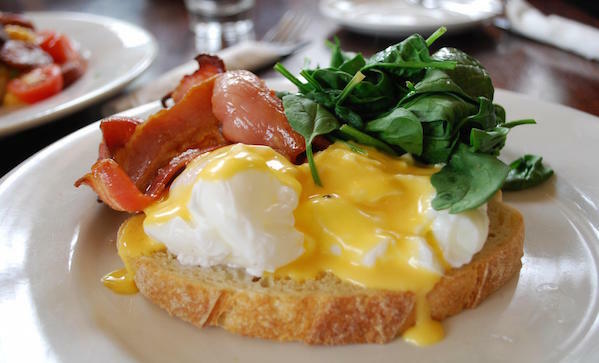 Need brunch, but can’t spend an hour chatting over fancy eggs? Not a problem—visit Le Cartet for it’s mini-food market and some Old Montreal charm to boot. It isn’t cheap (see: Old Montreal), but they do have fancy things you can take with you. And if you elect to eat in-house, there are some complimentary goodies like stuffed figs. Where have you heard of Beautys before? Well, if you’re a Mordecai Richler fan, you’ve seen it in The Apprenticeship of Duddy Kravitz. This wouldn’t be a brunch list if it didn’t include a spot for bagels and lox, and damn if this breakfast/lunch diner doesn’t have the best bagels and lox in town. Since 1942!